Spray all day - even over make-up! 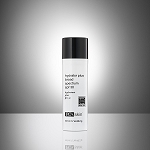 A light, water-based, paraben-free, oil-free, alcohol-free and fragrance-free Sunscreen Mist which refreshes and soothes the skin, while providing excellent sun protection - SPF 30 SAIAN gentle Sunscreen is perfect for all skin types, and especially formulated for acne and sensitive skin.This light and non-comedogenic sunscreen is made especially for the face. It comes in a beautiful and convenient spray bottle for easy and mess-free application. The 2oz bottle is the perfect size for men and women - fits easily in lady's purse or a gentleman's pocket. Simply mist on sun exposed areas as necessary. Perfect to use after laser, chemical peels, microdermabrasion, plastic surgery. 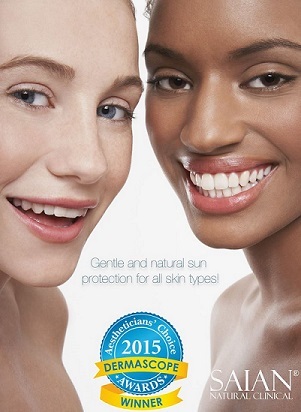 Titanium Dioxide provides total physical protection from harmful UVA and UVB rays. Apply on sun-exposed areas as necessary. Re-apply if active, sweaty or swimming. Could be applied over make-up.